The Second World War was a heavy burden for the colony and its population that suffered great misery. Most people lived in the countryside and depended on their pay. People were on their knees under the corvee (a form of offical forced labour) and the production quotas of obligatory cultivation, for which they received a very small allowance thanks to an acquisition monopoly. Upon his departure in 1946, governor-general Ryckmans was well aware of this distressful situaiton: "La limite est atteinte". 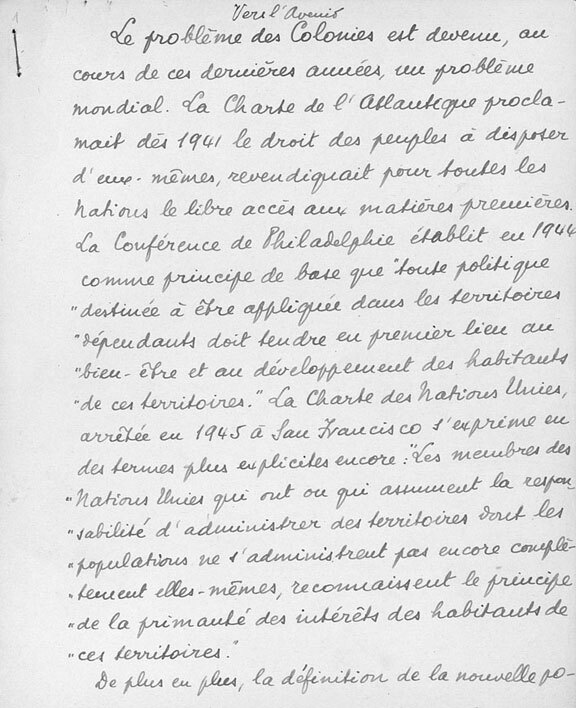 Draft version of the farewell address 'Vers l'avenir' of governor-general Pierre Ryckmans, 1946. NAB, Archives Pierre Ryckmans, no. 14/1.